Facebook, the biggest social networking platform with a massive user base of more than 2 billion monthly active users has become a prominent part of our lives. We all access Facebook very often to post a status update, check-in locations, share photos, engage with our family and friends, keep updated with trending news, business purposes and so on. Speaking of friend request, it’s a must to send or receive a friend request in order to be friends with someone on Facebook and connect privately. Being a long-time Facebook user, I also receive a ton of friends request from several people including unknown users whom I don’t know at all. As you may know, Facebook friend requests accumulate over time but they never expire. 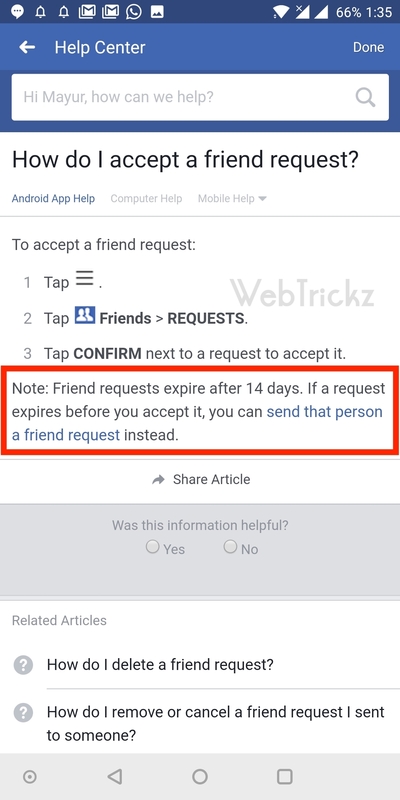 This means any requests received remains in your friend requests unless you either accept them or delete them. One can simply delete a certain request to remove it but if you don’t take any action then the request will stay active indefinitely. However, if the sender cancels the request while it’s awaiting your approval then the request will disappear from your friend requests. Well, Facebook seems to be changing this behaviour now by setting an expiry time for the friend requests. 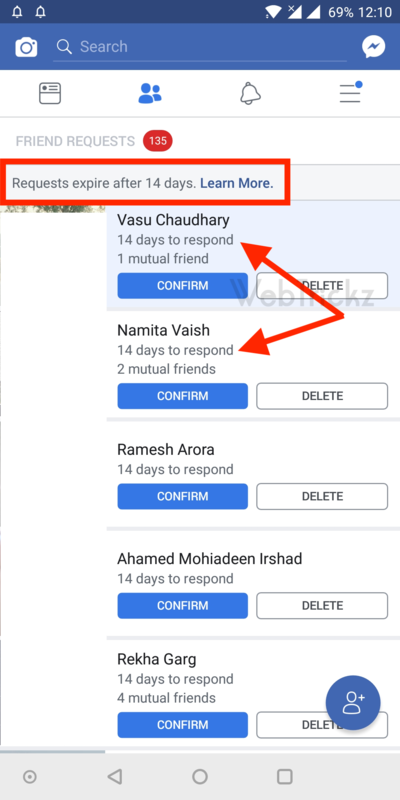 Earlier today, we noticed a completely new notification on “Friend Requests” page on Facebook app for Android. It reads that “Requests expire after 14 days.” and every request now individually shows that you’ve 14 days to respond. 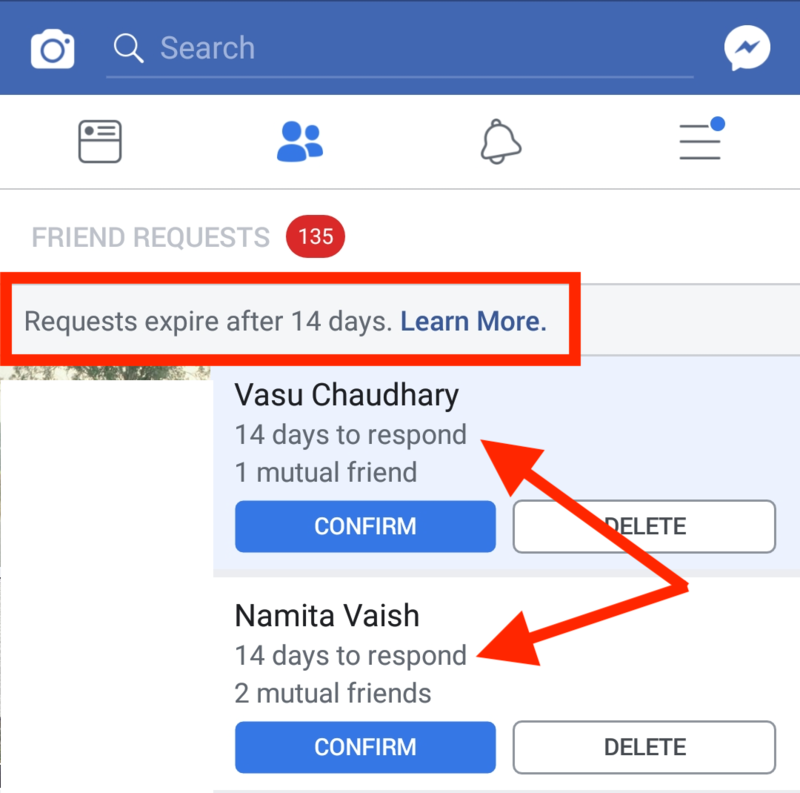 Tapping the learn more shows that Facebook friend requests will now expire after 14 days and if a request expires before you accept it, you can send that person a friend request instead. This is certainly a big change that hasn’t been officially announced yet by Facebook. It’d now be interesting to see all the pending friend requests on Facebook automatically expiring after 14 days. In our opinion, this is a good change which will ensure that users don’t have any unwanted requests clogging up. It will also push users to take a quick action on the requests rather than ignoring them forever. The 14 days waiting period is similar to what Facebook provides prior to deleting your Facebook account permanently. Let us know if you can see the above notification in your Facebook app and how this change would affect your usage? I do not like the 14 day pressure. I get 100s of requests and one way I decide is to see if my life naturally crosses to the person requesting. It is a safeguard for me. I now have 1000 requests I either have to deal with now or they just go away… we shall see which I prefer… but overall pretty tired of facebook always making changes… like one change I still miss us being able to look up all friends in a certain city. With friends all over the world, and with my travel, I used to li e the ease I could gather my friends in a certain city– or check on them if natural disaster occurred. I wonder if that means that they can re-request again at a later date? Will my followers also disappear if i dont accept them for 14 days?